Sockeye, or red, salmon is a species found in the northern Pacific Ocean and the rivers that discharge into it. They grow up to 2 feet 8 inches long, and they have deep red meat. 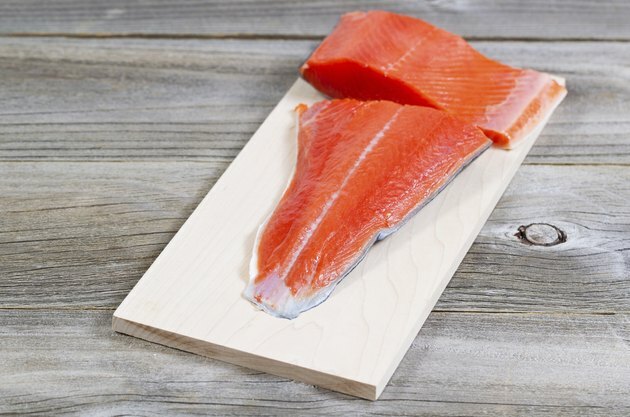 Sockeye salmon is slightly oily with a mild flavor that sits on the palette for seconds after taking a bite. Baked sockeye salmon goes well with light seasonings and has a soft, juicy texture. You will need about 20 minutes to bake sockeye salmon. Rinse the salmon fillets under cool water and pat them dry with paper towels. Set the fillets aside at room temperature. Distribute a thin layer of olive oil over the interior of a baking pan with a paper towel. You can also grease the pan with a thin layer of cooking spray. Lay the fillets in the pan and season with minced garlic, salt and pepper. Cover the baking pan with a sheet of aluminum foil. Place the salmon fillets into the oven and bake for 16 minutes or until the flesh flakes easily with a fork. Remove the baking pan from the oven and leave at room temperature for five minutes. Uncover the pan and check the salmon's internal temperature with a meat thermometer. If it does not register at least 145 degrees Fahrenheit, bake uncovered in five-minute increments until it does. Serve while hot. If you have a favorite salmon seasoning mixture, use it instead of the garlic, salt and pepper in this recipe.